Take hands-on learning to the next level with KEVA Contraptions! Create intricate, tunnels, towers, ramps and chutes with this interactive STEM tool! No glue, no connectors, just simple stacking and the laws of gravity. 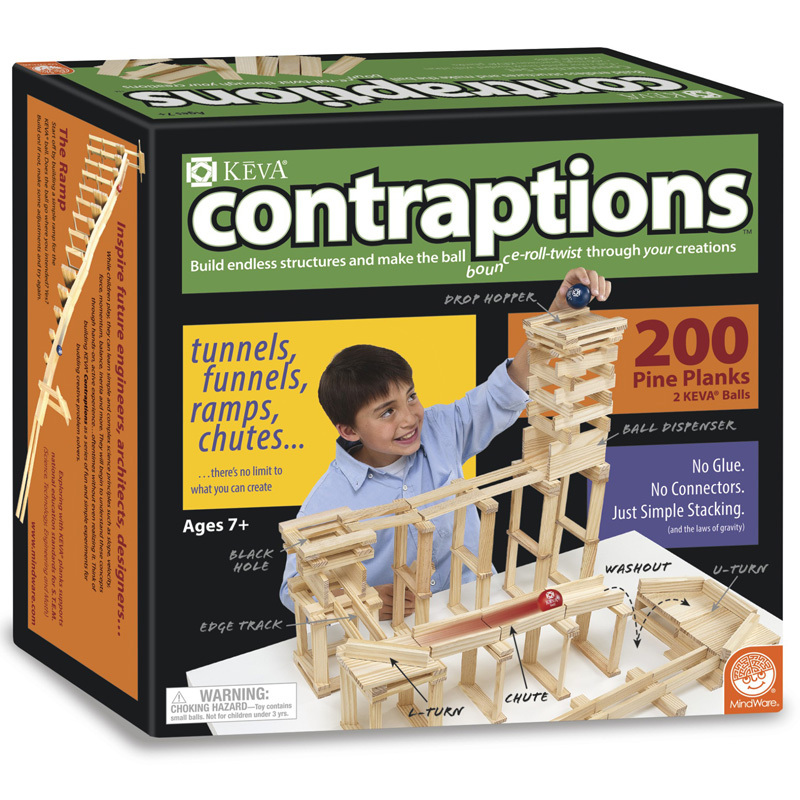 Each Contraptions construction set comes with 200 high-precision KEVA planks and two specially designed bouncy balls that are lightweight for maximum action! The detailed guide book shows you the steps needed to build numerous clever builds and is loaded with dozens of full-color photos, ideas and inventing tips. As you build, learn the principals of slope, velocity, force, momentum and balance. The "bounce" of the ball provides some of the most surprising moves—make it twist, bump, hop and stop. Projects vary in difficultly, making it suitable for a wide range of ages and abilities. Once you've mastered the suggested builds, use your imagination to create your own! KEVA Contraptions is an inspiration to future engineers, architects and designers and provides an amazing array of creative possibility. Learn the basics of physics and engineering. Strengthens analytical skills, resilience and creativity. Guide book is loaded with instructions, photos, ideas and tips. Includes 200 durable planks and two specially designed KEVA balls. Simple, high-quality materials for countless hours of fun . Age Recommendation: Ages 7 and up. WARNING: CHOKING HAZARD - This toy is a small ball. Not for children under 3 years.